I bought Organic Cream of Earl Grey from DavidsTea in their prepackaged ‘rainbow’ tin ($15 for 80g, or 3 tins for $30). It’s a sturdy metal tin, the tea inside comes into a sealed plastic bag that can be resealed. Taking in a sniff of the tea, I can make out the bergamot oil – a very nice citrus smell, and the smell of vanilla. The ingredients listed are: black tea, cornflowers, marigolds, with “natural flavouring”. 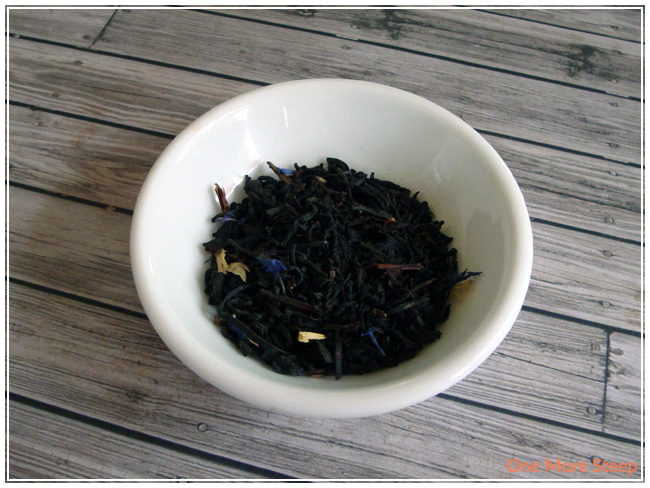 The flower petals are very obvious and easy to tell in the loose tea. It smells delicious. DavidsTea claims that “Lovers of Earl Grey adore this creamy alternative to the original blend. We’ve added a touch of vanilla for an unexpectedly rich taste.” – bold claims when I adore Earl Grey. Things I liked about the packaging – the loose tea comes in a resealable bag and the lid fits on well. I’ve had this tin for a while, and it tastes the same now as it does when I first tired it a few months ago. With the bag and the tin, it helps keep the tea protected from air and light – I appreciate when tea comes in storage that works! The tea looks great and the smell is lovely. The scent of bergamot and vanilla is very inviting. DavidsTea’s recommendation is to use water that is 96°C (or 205°F) and to steep for 4-7 minutes. I use a metal tea steeper when I’m at home. I steeped the tea for about 5-6 minutes. When the tea was finished steeping, the aroma of vanilla was very welcoming. The colour is a rich golden brown colour. 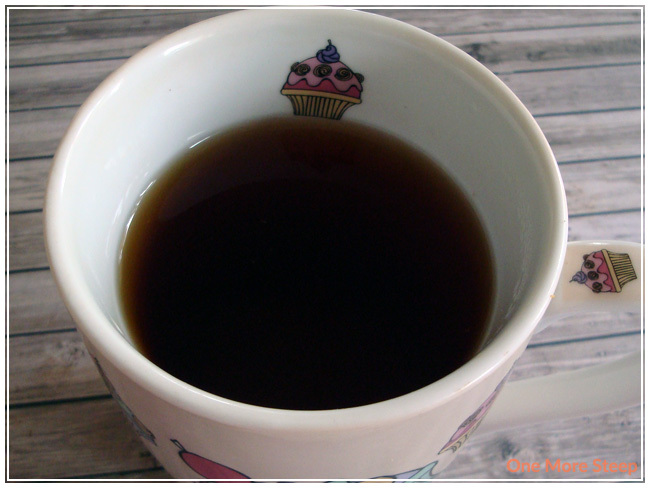 On first taste, I can taste the black tea but not so much the vanilla – although I can smell the vanilla. The bergamot stands out well in the tea though! It’s one of the things I love about Earl Grey – the bergamot with the black tea. But for the Cream of Earl Grey, the bergamot isn’t as strong as it is in Earl Grey. I was tempted to try it out with some sugar and some milk to see if I would like it better. I’m just not that big of a fan of it straight compared to plain Earl Grey. Adding sugar helped to bring out the natural flavours of the tea a bit more, and definitely made it taste creamier. With the addition of milk, I enjoyed it a lot more and it makes it taste a bit more like a London Fog (an Earl Grey latte). I definitely enjoy this tea with sugar and milk, not so much plain. There’s just something about it that I don’t like. There’s no bitter aftertaste or anything obviously wrong with it, but I just don’t like it as much as I do normal Earl Grey tea. When steeping for cup number two, I steeped it for 7 minutes with water at the appropriate water temperature. It tastes less like an Earl Grey and more like a weak black tea. There is a distinct lack of vanilla and bergamot aroma the second time around. As a weak black tea, it isn’t impressing, so it’s not the greatest tea for one more steep. 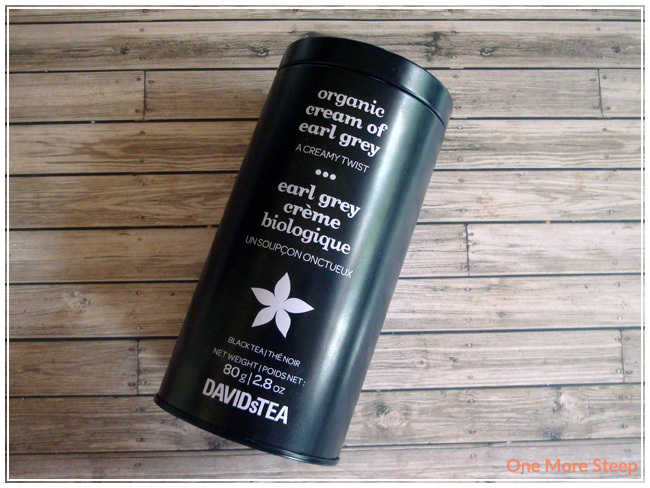 I liked DavidsTea’s Organic Cream of Earl Grey. 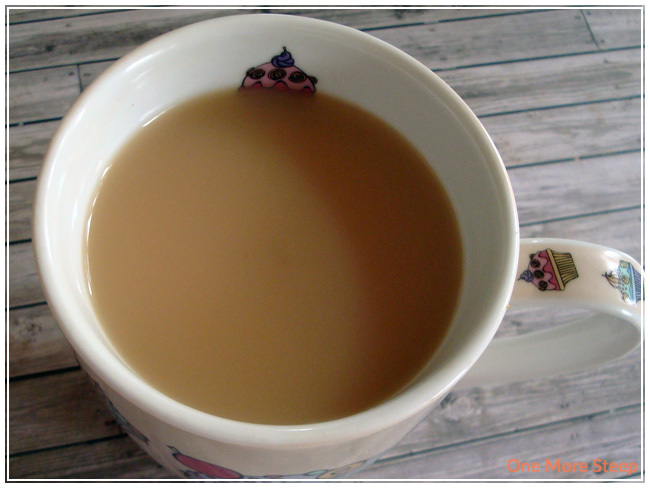 I’m not a fan of the tea straight, but I really enjoyed it with sugar and milk – definitely the way to go! While the tea was not impressive with a second steep, I liked the first cup (albeit doctored up a bit). I would definitely have more of this tea, but I’m not entirely sure if I would get more when I’m done with the tin.